It's Worse Than That, It's Carnage, Jim! Lord knows how long they've been up, but instead of announcing the forthcoming cuts to services in their "News" section as Konect did, Anglian have sneeked them very quietly onto the timetable section, with the option to download the new timetables. I did just that and it's worse than I first thought. I'll go through them in numerical order. This service will run half hourly between Norwich and Lowestoft. There will be a reduction from 30 departures from Norwich on a weekday to 22. Middleton Rd (for Gorleston 6th form college) will no longer be served, instead the 7 will run via First's 1/1A via Avondale Rd to James Paget, where it will then run via Mariner's Compass (on First's 8 route) before resuming the normal route to Hopton. This has added 5 mins to the journey time from Yarmouth to Lowestoft. Onward passengers to Kessingland and Southwold will now have to change at Lowestoft where there is a convenient 17 min wait for the Southwold connection. THERE IS NO LONGER A SUNDAY SERVICE BETWEEN NORWICH AND LOWESTOFT. This service has been withdrawn in its entirety. New service 60J to operate 3 journeys a day between Lowestoft and JPH via Lound and Blundeston. Although the timetable has been changed the general frequency and number of services has been unchanged. The basic 20 min frequency between Lowestoft and Kessingland remains. However the frequency to Southwold reverts to one an hour, with all journeys operating via Wangford. Kessingland Beach barely gets a service, with only 4 services each way a day. The evening services remain, but Sunday services are slashed, with an hourly service between Lowestoft and Kessingland, but only two hourly to Southwold, wth the last bus from Southwold leaving at 1503, and the last bus from Lowestoft leaving at 1704. This one took me by surprise. There is an overall cut in services on this route of around 40%. All services will revert to the former route between Beccles and Bungay via Gillingham and Ditchingham. There will be only 3 fast journeys between Beccles and Yarmouth with the other 3 (yes only 6 in total) operating via the current 81A route via Aldeby and Toft Monks. With the withdrawal of the 60 this means that instead of 22 services a day between Beccles and Bungay there wll now only be 7 - and one of those is at 6am. General daytime frequencies unchanged, with a basic half hourly service on the 87, and half hourly service between Norwich and Bungay. There are some peak time changes, however, and students in particular need to beware of those. Most journeys between Norwich and Halesworth are renumbered X88 but I can't for the life of me work out why as they are not any faster, and serve everywhere the current fast 88's do. The popular current X88's which run fast between Bungay and Poringland have been withdrawn and the two 1530 departures from Norwich have been merged into one slow service taking 20 mins longer to get to Halesworth. In fact the X88 will take precisely 1 min longer between Halesworth and Norwich than the current 88. Makes perfect sense and an opportunity missed there I feel. That is it. All very sad, and not a single note of positivity to report. I think Go-Ahead should change their name because if these cuts, and those at Konect are anything to go by they could well be breaking the Trades Description Act. Huge steps backwards, and my word we need somene to step in and stop the rot. I must thank my friends at North West Bus blog for alerting me via Twitter to this news. Well I say news but really it's not the most earth shattering revelations. According to Government figures local bus journeys in England have fallen by 27 million in the year to March 2015. That sounds a lot, but actually only accounts for 0.6% of total journeys made, which still stands at 4.56 billion. Take a second to take that figure in - 4.65 billion local bus journeys taken a year. Unfortunately there don't appear to be any stats on how many car journeys a year are made as that would have been an interesting comparison. The stats also show total bus mileage dropped by 0.6%, which I initially thought was the number of services operated, but having re-read the article now think may mean the total mileeage travelled by passengers, as it says that is mainy due to a 10% decrease in the distance travelled on local authority subsidsed services outside London, which probably is due to the ever decreasing number of services subsidised anyway! Another factor will be that fares rose by an average of 3.3% which when you consider the low price of diesel and the national inflation rate of 0.9% is nothing short of pure greed by the operators, regardless of their lame excuses about how they buy fuel. Certainly wages haven't riisen by 3.3% either. It will be interesting to see what the fares rises are this year but let me give you a reason why operators should consider reducing fares not increasing them. Earlier in the year First reduced the single fare on their 99 between Kessingland and Lowestoft to £1. Much to everyone's surprise, not least First themselves, Anglian did not respond in kind, choosing instead to double the number of their buses in the area but charging more than double the fare. First initially intended the £1 fare to be for a limited period but something extraordinary has happened - they are making more money charging £1 than they did charging £2.40 so the £1 is staying. I have noticed 99's with more and more people on them and as for Anglian? Well in October the frequency in Kessingland will be halved from 6 to 3 buses an hour, and as I understand it in November will be further reduced to 2 buses an hour, meaning for the first time there will be more 99's than 61's in Kessingland. I do hope First don't get greedy again and put the fares back up. So what I and many others have been saying for years, that you can actually make more charging lower fares has been proved correct and I look forward to First trying that strategy on a route that does not have competition on it to further test the theory. Give people a reason to leave cars at home and money talks these days. Loudly. But back to the article, and many are saying that the way buses are financed needs to change. Funny - I said that a couple of weeks ago and have my own ideas and plans as to how that can happen. The forthcoing Bus Bill is all well and good, but it is only going to give some local authorities the option to take all bus services "in house", and as far as I can see will only benefit the big towns and cities, not rural areas. I have already been told there is no new money available, which defeats the object of the exercise, as it's more money that is sorely needed. Clearly this cannot come from the public purse so other means have to be discovered and explored. We are all still waiting for the details of the November cuts by Anglian, who are really dragging their heels in letting their passengers know if they will still have a service or not. It is all very unimpressive, especially taking into account how quickly Konect released full details of their cuts. As soon as Anglian do say something I'll let you know. Ok only on the CCTV front, where we are world leaders in monitoring the everyday movements of our own people, but on every other front we are nothing like North Korea, especially when it comes to freedom of speech and the power of the press, but it seems there are some who wish we were as scared to speak the truth as the North Koreans are. Until last night I was struggling for a topic to write about today, and then, very sadly one fell into my lap. Norwich Bus Page has ceased to be a blog, and will instead become a webpage with timetables, fleet lists and galleries etc, but no more news reporting. I suggest everyone reads the last post on there - the link is in the sidebar with all the other blogs. Let me ask a rhetorical question. What is a bus company's, or any other transport operator's come to think of it, most valuable asset? Their premises? Their vehicles? The contracts they have? Their staff? No, it's none of those, although staff are right up there. None of the aforementioned would exist without the passengers. Like any business if there are no customers then there is no business. As we all know to our cost empty buses don't make money, so why oh why do some operators treat customers which such disdain it's no wonder they stick not only to their cars but also a giant middle finger up at the very notion of using public transport. In the years I worked in the public transport industry, both buses and trains, one complaint remained the most vociferous, and from what I understand still does - lack of information. I have mentioned before the use of the word incident - which I refused point blank to use myself and appealed for more accurate and clear explanations for delays and cancellations. I was criticised by people saying only enthusiasts actually wanted to know specific reasons and that vague reasons would do. Sorry, that is not the way we do it in this country, or the word "enquiry" wouldn't exist. We live in a blame culture, and people want a reason to put blame, not necessarily a person but a definitive reason why they are being delayed. Part of that information process is knowing what services are available in advance. If services are going to change then the customers should be given as much prior notiice as possible. That's why I could go on Greater Anglia's website right now and see what engineering work was taking place in December. The railway industry is beginning to learn that if you actually tell the public what's going on then they accept it and complaints drop. Passengers are NOT stupid - and they know that some things just cannot be avoided. Treat them as kids, as though they are not mature enough to handle information and that's when you get the grief. Now to the case in point. VOSA and the Traffic Commissioners are there for a reason. 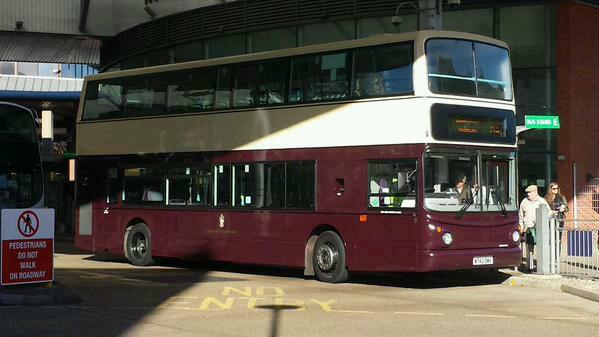 Any changes to bus services have to be logged with VOSA a minimum of 56 days in advance. This is to protect the public, so no operator can change services overnight without giving due notice. VOSA publish daily those changes registered. Now you might ask who do they publish them for. Is it for bloggers like me? Is it so competitve operators can see what everyone else is up to? No. It's not. It's so ANYONE can see, if they want, what is going to happen to services. It is for the PUBLIC to look at. If it wasn't VOSA wouldn't publish it. Therefore once something is on VOSA it is reportable. It is in the public domain, and operators cannot whinge and get insulting about that information being reported. Let me give a comparison. When a footballer transfers to another club when do the fans first hear about it - when the club do their official unveiling and a press conference, or has it been all over the back pages before then, first in rumour, then when the transfer is official and the player registered at the FA. The operators cannot have it both ways - they are more than happy to use the press and indeed bloggers when they want something put out, but they cannot keep trying to move the goalposts when it is negative news. The public have a right to know when a service is being cut, not only so they can make alternative arrangements, but as in the case of the 2/2A a protest can be put together to try and save the service, which surely would be in everyone's best interests anyway - those very jobs being quoted as being at risk for a start. How can trying to save a service be a bad thing? It might just wake people up to the reality that there is a service there and more will start to use it. We live, thankfuly in a free country. That is why the rest of the world wants to live here. One of those freedoms is that we can report things and hold others to task if it affects people. Cutting services always affects people, regardless of how few, and operators simply cannot dictate how that is reported. If Konect had sent out a brief press release (including the blogs) prior to the VOSA registrations stating that service cuts were unfortunately having to be made, giving brief details but promising further information in due course then there would have been none of the turmoil the erratic reporting has created, and no one could have claimed the moral high ground. Operators you need the public, and you need publicity to get the public aware of your services. But you cannot pick and choose how the news is reported, and negative developments have just as much impact, if not more, than positive developments. The public have a right to know, and it is the responsiblity of both the press, including blogs, AND operators, to keep the public informed at the first opportunity. VOSA is our first opportunity and I will keep reporting anything I see on VOSA AS I SEE IT in order to keep passengers informed as to what service changes may be taking place. After all, turn my laptop off and I am a passenger myself. I have been waiting over a week to break this news but thanks to the VOSA website being down have been unable to get all the details. However, hot on the heels of Konect's draconian cuts coming on November 2nd is the news that on the same day Anglian is cutting its services too, and reducing the on road fleet by some 33%. Please note the underneath is subject to change, but this is what I have gathered from multiple sources. The main casualty is the 60, which runs between James Paget Hospital and Bungay via Lowestoft and Beccles. This service is being scrapped completely. The 60H from Beccles to Halesworth and 60S from Beccles to Southwold will continue to operate but with changed timetables, so as yet I don't know if frequencies will be maintained. For those in Lound and Blundeston, currently served by the 60 a new 60J will operate three times a day serving those villages. The 7 and 61 is changing too. Again full details are to be confirmed, but from what I understand the 7 will now operate between Norwich and Lowestoft - in fact VOSA confirms that - with a change of bus required at Lowestoft for the 61 to Kessingland and Southwold. Frequency will be reduced to every 30 mins. There was debate about changes to the route between Lowestoft and Gorleston, but I have had no firm confirmation yet so won't publish the rumours! The Beccles Town Service 82 is having route and timetable alterations. There was talk about the service being scrapped but that decision has been reviewed. 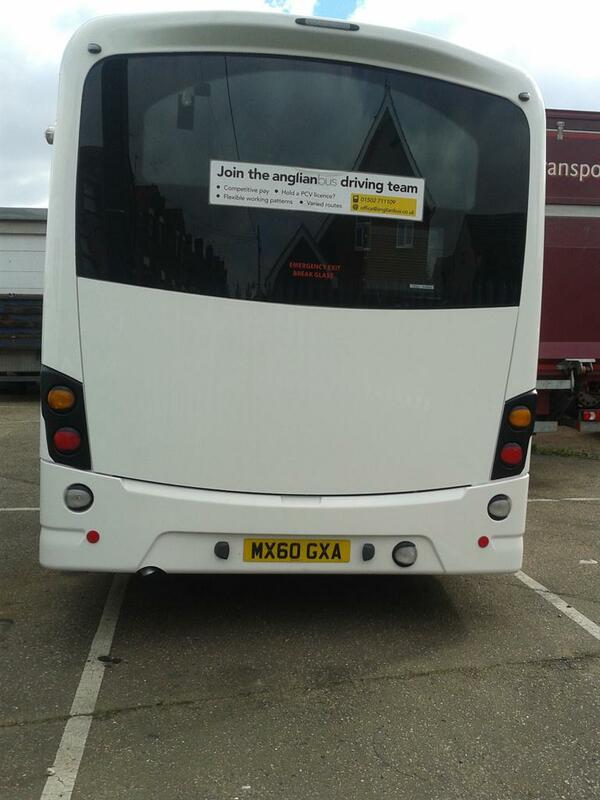 However there have been no changes registered on VOSA for the 83/4/5/6, which are sponsored routes. There are timetable changes to the 80/81 between Great Yarmouth and Diss. I presume most of these will affect the journeys between Beccles and Bungay. At the moment the 80 goes fast via Shipmeadow (very popular too I gather) but if the 60 has been scrapped I would think, though must emphasise not been confirmed yet, that the 80 will revert to its former route via Broome and Dtchingham. As soon as I receive confirmation I'll publish it. The only positive news appears to affect the 88 between Halesworth and Norwich. It would seem that after the success of the one journey a day each way there are to be more X88 journeys running fast between Bungay/Poringland/Norwich. As a result the 88A from Southwold to Halesworth timetable is changing too. If this is the case I am delighted as I'll personally benefit from that. However the cynical side of me wonders if this is to match the journey time of Borderbus's 146 between Norwich and Southwold. Again I'll confirm when timetables are released. All in all it's not good. When Go-Ahead took over Anglian there were over 100 vehicles. Now that will drop to less than 40. Go-Ahead? Seems a huge step backwards again. Anyway that is the jist of it as I know it. I was told Anglian were making a press release by the end of last week. They haven't. It is also notable that within a couple of days of notices going up on VOSA Konect had the details on their website. Anglian haven't, and I'm afraid that rather sums things up. Passengers are not just put last they don't even enter the equation right now. All very depressing, but as one of my commentors pointed out you can always jump in a taxi and we must have chosen to live in an area with poor transport links so really folks it's all our fault! I'll publish full details on these changes as soon as I have them. A Touch Of The DRT's! First of all thanks to everyone - well except one - for the warm welcome back. Very gratifying, if a bit sooner than I was planning. I hope the new focus manages to keep everyone's interest, but if you have logged in hoping to see a lot of pretty pictures then I'm sorry but that won't be the focus anymore. Having said that I do have a couple of good pics as a bonus at the end of this post, but it will be the exception rather than the rule. Those of you who have followed the blog from the outset will know that if I am to escape the idyllic setting of my village I am wholly reliant on Suffolk Links (SL), who provide Demand Responsive Transport (DRT) on behalf of Suffolk County Council. For those of you who don't know how it works it is a cross between a bus and a minicab. You ring in advance, book the bus to take you within a defined area, and it will turn up and take you there, for the same price as a bus fare, but also accepts Concessionary Passes. This is good, however there are a few down sides too. Firstly other people have the cheek to use the service, which means that the time you want cannot be guaranteed, and occasionally there won't be time to get you exactly where you want to go, so a plan B, C or even K is needed. Lastly you can only have two live bookings at any one time, which is frustrating if you need to get out more than twice a week. But I couldn't live without it and the positives far outweigh the negatives. The service runs Mon - Sat 7am - 7pm so evenng and Sunday travel is a no-no, making bus rallies difficult unless you know someone called Tim! It is designed to link areas without a reguar bus service to the bus network, although it is increasingly used to take old ladies to the supermaket or the hairdressers. At this point I need to also mention Dial-a-Ride (DR), which is the other form of demand transport, which is the one for customers with more serious personal needs, who cannot walk to and from bus stops, and should be the one to take old ladies to the hairdressers. More on that later. On Monday I had the pleasure of being chauffeured around by the Transport Manager of my local SL operator, who had been forced onto the road due to staff sickness. This gave me the perfect opportunity to quiz him about the operational side, snd plans for the future. It wasn't a very optimistic prognosis. Over the next 5 years funding for DRT is going to be cut by 50%. This is not good news. As yet it is unknown how this will impact on services, but it has been suggested that the service will have to operate strictly as per description, and will operate bus stop to bus stop, not door to door as it does now. That's actually fine by me as I mainly use it to connect to the bus network, what is left of it that is, and here is the problem as I see it. You cannot connect to a bus network if there is no bus network left to connect to. With increasing cuts to rural services demand for DRT is increasing itself and let me give you today's little adventure as an example. I was asked at short notice to play the organ at a funeral near Wickham Market. 6 months ago I could have caught the 196 to Saxmndham, the 64 to Wickham, played for the funeral and made the journey in reverse without a problem. But. In the last 6 months we no longer have a 196 on a Wednesday, and now the 64 is 2 hourly and doesn't connect with anything the journey by service bus is now impossible. So a 15 min call to the amazing girls at Suffolk Links Monday morning ensued and this is how my journey had to be made. Due to over demand on a Wednesday (due to the 196 going a different route) I could only be taken to Framlingham, where I had to wait 35 mins for the PH Travel operated 62 to Wickham Market. Pleased to see 15 passengers on that one. I walked from Wickham to the village I was playing at. Returning the vicar gave me a lift back to Wickham where I caught one of the few remaining 64's to Saxmundham (66984 FYI) where I had another 45 min wait for SL to get me home. Luckily the sun was out so no probs, but if I hadn't known the bus network and times like the back of my hand I couldn't have made the journey. Sometimes being an anorak has its uses. That is as the service is now, so Lord only knows how tough it's going to be when the cuts start biting. One idea the Transport Manager and I discussed was this. The reason SL take old ladies to the hairdressers and not DR is blatantly obvious. DR, despite being operated by the same people does NOT accept Concessionary Passes, and Suffolk Links does. Thus SL gets over booked and DR buses are twiddling their thumbs. No one seems to know why this is, although it could have something to do with the fact Suffolk Links drivers (saints) are paid whereas DR drivers are volunteers. But surely if DR accepted passes then more passengers could be catered for on SL. If SL is only going to go bus stop to bus stop in the future then this must be considered. Of course if the rural bus network suddenly experiences a revival over the next few years, which is my aim then it will ease the pressure on SL and it will be able to serve the people who need it most, rather than catering for people who used to have a regular bus service but don't now. I have no idea how the system is in Norfolk and Essex, so if anyone could let me know so a comparison of systems can be made I'll be grateful. That links me nicely (groan) onto a couple of pleas I received yesterday asking for more coverage of Essex. Guys, nothing would please me more than to cover more of Essex, but it is a HUGE county with an equally HUGE bus network, and it's hard enough keeping up wth Norfolk and Suffolk. A few months ago I appealed for an Essex correspondent to keep me abreast of the Essex scene. I got no replies so I repeat my plea. If anyone from Essex would like to help me publicise the Essex scene and campaign for better rural services there then please get in touch and let me know - I'll be delighted to hear from you! Now the bonus pics. Firstly today saw the first sightings of First Lowestoft heritage bus 30888 back in service sporting the really eye catching Lowestoft Transport .livery. My thanks go to Bus Badger and Tim Miller for sending in the pics. Tim has also provided me with another picture today. I was surprised to read in more than one location over the weekend that all the Anglian Streetlites had been painted white. This is simply not the case. 350 and 352 had been painted, but 351 will take another number of weeks yet and 353 has only been painted in the last 24 hours, and here she is! Thanks to my friends at Anglian for confirming the information. 352 has inceidentally become the first to leave Beccles and has returned to Mistral (dealer). Also read in the same locations was the claim that all the returned Versas were in service with Anglian logos applied. Again this is not the case and to my knowledge only 305 and 306 have had Anglian vinys applied. Certainly 307 was as bald as Chris Speed yesterday and devoid of any vinyls. Looking forward to a flood of Essex emails! This is not a U-Turn. If I'm honest I haven't missed blogging one bit. In fact it's been wonderful to get home and not have to worry about posting. I haven't had to bother about getting pics of new vehicles first, or concern myself about having my news nicked by others. No one promising to help then letting me down or anonymous cowards calling me names. So why the hell have I come back? Quite simply I was asked. I've had many really nice emails from people I never knew read the blog saying how much they missed it, and I can't express how good that was, and thank you to everyone who has been in touch. However, it is not because of that I was persuaded to re-think my position. However it's going to be different. I will not be chasing news. The only news I'll be reporting will be news I receive first hand. I will not be concentrating nearly as much on vehicles but on services. The original aim of the blog was to be a voice for transport users, lobbying operators and Councils to maintain and improve services, particularly in rural areas. I veered away from that policy but from now on it will be my priority. The blog will work in conjunction with a new project I have, which is still very much in its formative stage and will involve consulting a lot of people, but will have the aim of improving rural links for everyone, and for multiple purposes, despite the current apathy of our politicians towards rural bus services. Norwich - London in 90 is fine, but how about Leiston - Ipswich in 60? How about Halesworth - Norwich in 45? 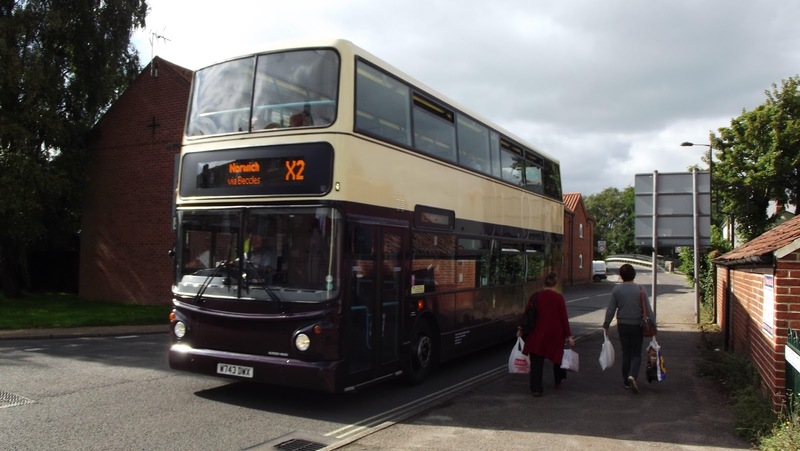 One of my main goals is for integrated ticketing, so for example fare payers can travel from Leiston to Saxmundham on First's 64, do their shopping and get BorderBus 521 back if they want JUST LIKE PASS HOLDERS CAN! How can companies bleat about not enough fare payers when they do naff all to give them reasons to spend their money on buses rather than petrol in their cars. This week has been another bad week with Go-Ahead announcing a series of service cuts across the Konect and Anglian network. The number of vehicles at both companies is to be cut dramatically. The most surprising by far is Konect's decision to scrap the 2/2A between Norwich - Sheringham - Holt less than a month after branding 5 buses for the route in a blaze of publicity. Why didn't they say then the route was at risk? Where were the attempts to attract more passengers to the route with financial incentives? If the route was that poorly patronised why put higher capacity vehicles on it? Just doesn't make sense to me, and I fear most of these cuts have been ordered from up on high rather than local decisions. So the time has come to act rather than just criticise, and an entirely new approach to bus services and how they are financed is needed. We cannot rely on deregulation coming to East Anglia and it looks highly likely that in 10 years time if you don't live in a town or city you won't know what a bus looks like. It's now or never, and frankly my dears, we have nothing to lose by giving it our all to Save Our Services. I'll certainly be giving it mine.